I am packing for TechEd Barcelona 2018 this week. First time in Spain but not my first trip to EMEA for TechEd. 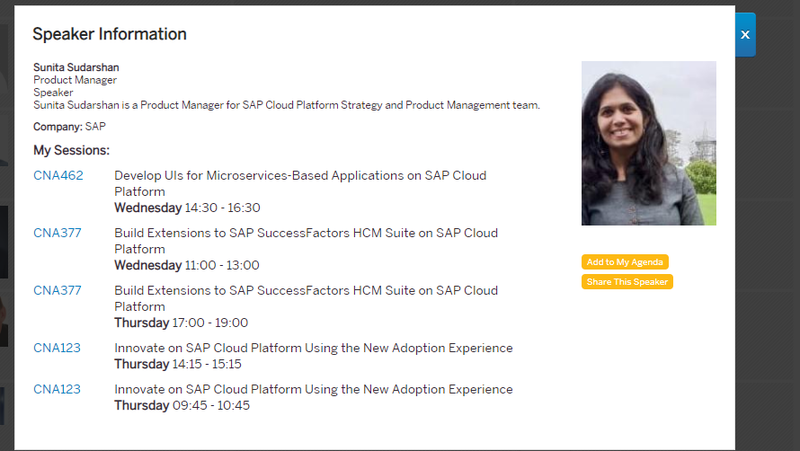 Should be an interesting journey given my personal steps this past year, and perhaps this could be my farewell SAP event, depending on what 2019 and beyond holds. Let’s make the most if it, which of course means grappling with calendars and conflicting events forthwith. I made preliminary advice to a new attendee in a recent post that I myself should take heed of. 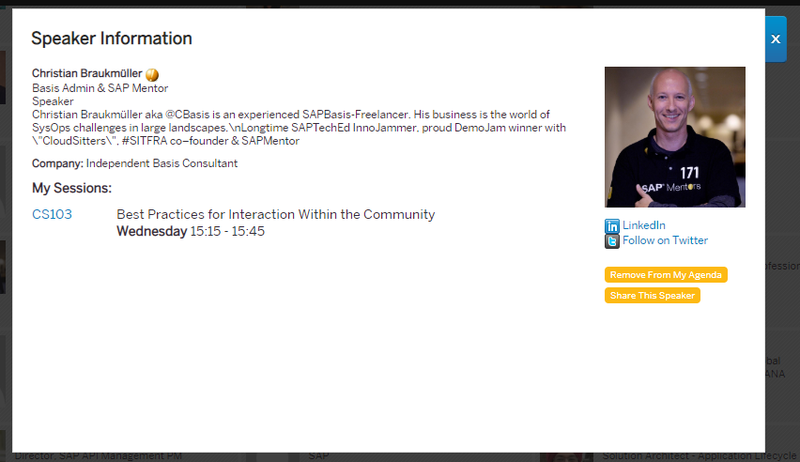 Explore and build with APIs and prepackaged integrations from SAP API Business Hub. These aren’t “tracks”, they are “Learning Journey” categories, 2 of the 8 filter dimensions. With too much time on my hands I’d spin the wheel and filter by other angles. Maybe, eventually. Didn’t take long to have session overlaps. I suppose the above choice of “take it or leave it” is workable. 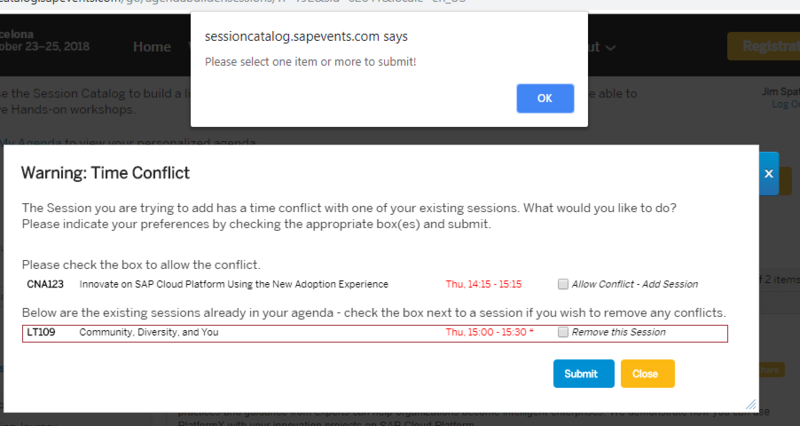 A higher sophistication level in the conflict resolution algorithm would be to show repeat sessions in this pop-up (as can be seen elsewhere) or to suggest a near miss that would suffice. Here’s the “Additional Time(s)” where OPP202 is being offered. A first cut, only visible by drilling down and then back up the “my Agenda”. Perhaps a workaround for “how bad are my double/triple bookings” would be the above page on another tab. 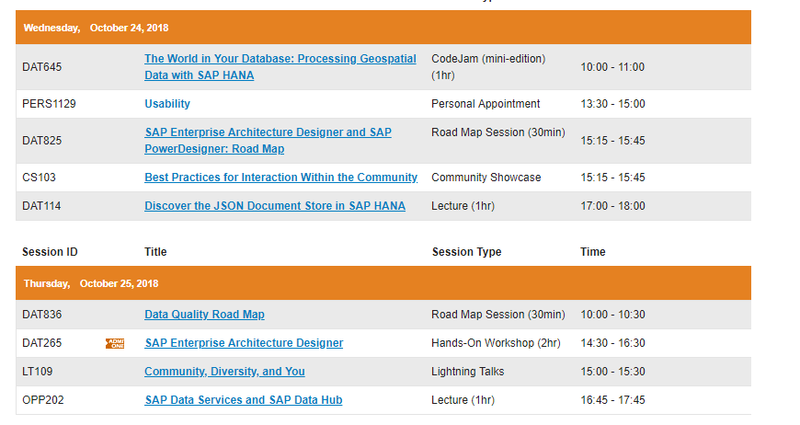 What would be better is to see both the high level merged schedule with each details session or speaker. Not that I have the screen real estate currently to make that digestible, just wishing out loud. Flipping from catalog browsing by session, I found DJ Adams near the front of the pages (sorted by last name, and as I recall this was sometimes by first name. could be wrong about that). I was puzzled by the “Add to My Agenda” button first, because I expected all 3 listed appointments to be added. Wrong. Version 1 of the “Show My Agenda” email, after adding a Usability session on that site, then adding it manually in the agenda builder as a personal appointment. My browser window would not show all 3 days so Wed/Thu are in this screen shot. October 23rd is looking better, with no large gaps nor 4 things at once (it’s early days of course). Wait, now the Excel file “AgendaDownload (3).xls” doesn’t look like the online page. Issue 1 – the date format for personal slots is American style, not Euro style. Issue 2 – the time format similarly rocks the edge of the universe with a 12-hour notation as against the Euro-typical 24 hour one. Meaning my Excel file has Wednesday meetings before Tuesday. Back again to look for speakers on topics I might want to grok. I picked a hardware vendor first; this might be one where I speed read the PDF and ping the speaker or other network colleagues instead of sitting face-to-face. An agile choice maybe. I randomly picked another speaker as their bio title read simply “Product Manager” without qualification. I’ve no background in HCM, but maybe UIs for Microservices Based Applications could be a treat? 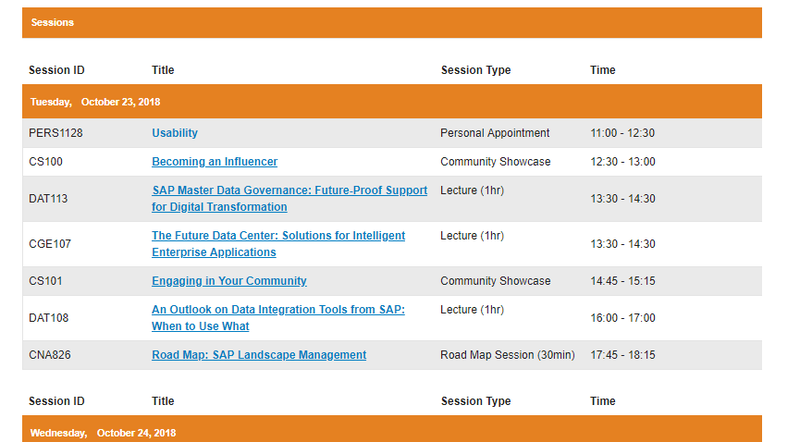 The last image above shows the results of “Add to Agenda” for a speaker. Click on the “down-blue-arrow” and follow the path to add a specific session from that speaker. Conflict resolved? Naturally I had to see what happened if I didn’t click a choice. The Session you are trying to add has a time conflict with one of your existing sessions. Please indicate your preferences by checking the appropriate box(es) and submit. Please check the box to allow the conflict. - check the box next to a session if you wish to remove any conflicts. I deleted other speakers from that section of My Agenda after picking times that met my needs, as far as I can tell. Alas, their names are not shown on the agenda so if I end up with a resolvable conflict it might take me a while to get the corners square. Lastly, whatever happened to “merge my agenda to my Outlook/Apple/Google calendar? I looked for ICS files and found none. I know more now how to generate a ICAL file then I did a few months back, so I’m good. Anyone else miss this or find how to set reminders outside this silo? p.s. 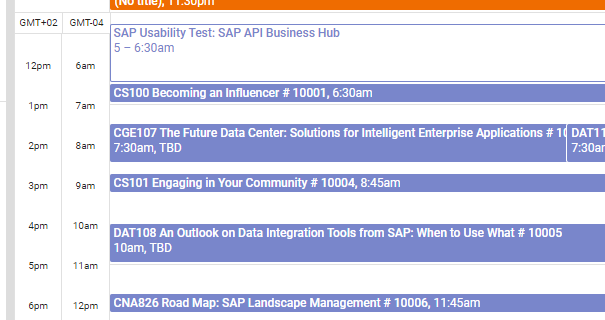 No SAP Mentor sessions folded in yet. I bloody hate conference apps. They meet no real user needs. All anyone wants to know is the agenda. 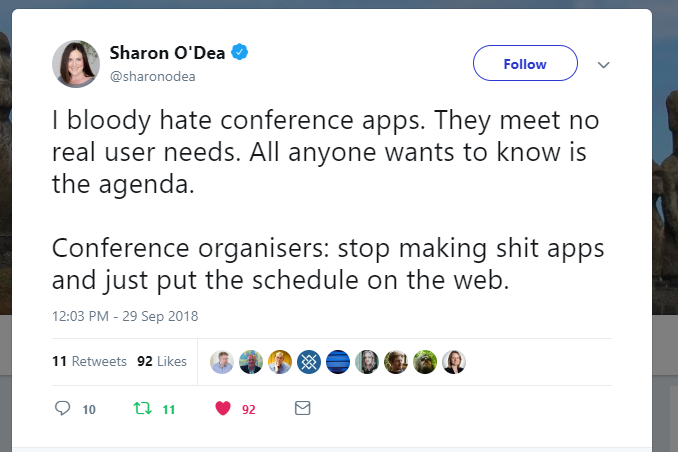 Conference organisers: stop making s**t apps and just put the schedule on the web. Speaker names *are* in the CSV export, so that’s a plus. I did the needful and put my own appointments in a personal database so I can then use a Perl script <ahem> to generate ICS files that Google calendar consumes correctly. 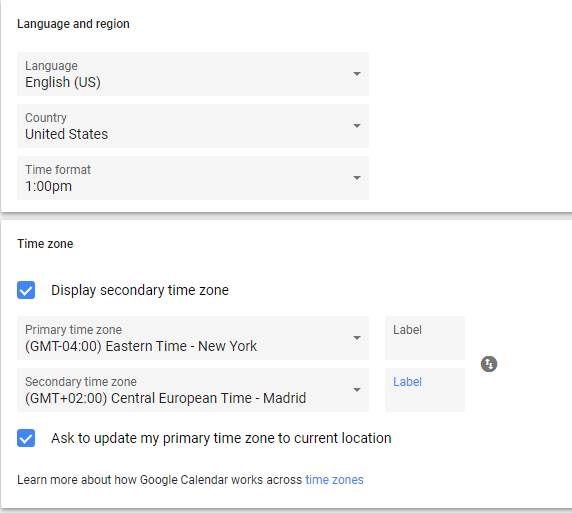 I learned that “Europe/Barcelona” does not compute as the right timezone; “Europe/Madrid” works for google cal. Much clearer visualization of the overlaps and start times. Except: the listed times are CET, not my home timezone of GMT-4 (currently). Odd that Barcelona is nearly due south From Greenwich England and is 2 hours from the GMT universal clock, too. Perhaps Outlook has a menu like the above, in its cryptic way. Once the meetings are in the calendar I can see them when the TechEd wall clocks will indicate (or on the mobile, yes?). Better. 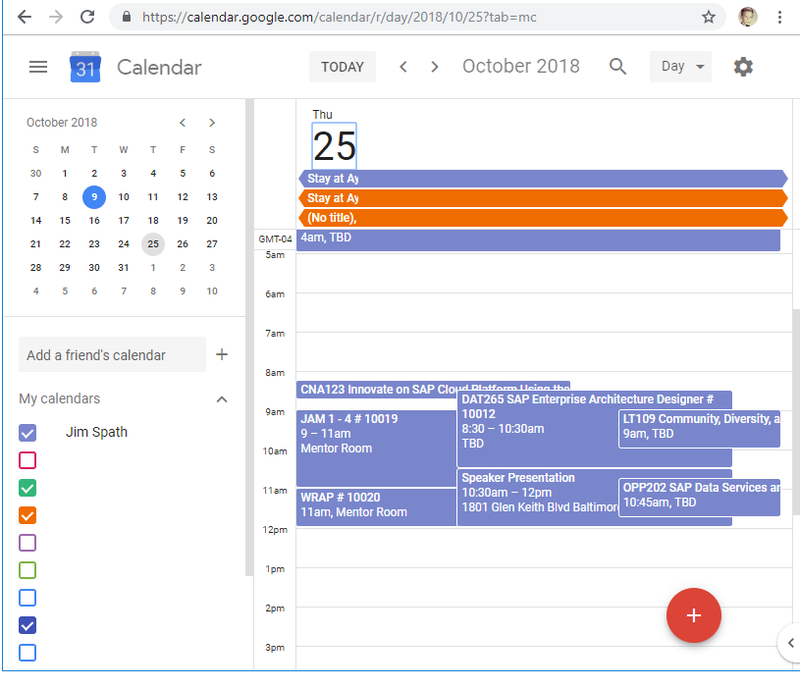 Because the Usability sessions use a different app entirely from the conference app, those appointments were added by Google after the email reminder was delivered. The color above is different, and the timezone was correct. We’ll see if that stays in the right place on the calendar after the devices resynch on arrival. Finally, I’ll leave my personally generated ICS data for one meeting, to show this is not rocket science exactly. I chopped the lines off; strictly speaking the standard has an odd 70-or so line limit but in practice longer work OK. My next pass will add speaker names to the front of the description field. creativity and success, in both physical and online communities. which leads to innovative discussions and creative support of members. I was very disappointed that there was no option to download ICS or VCS files too. 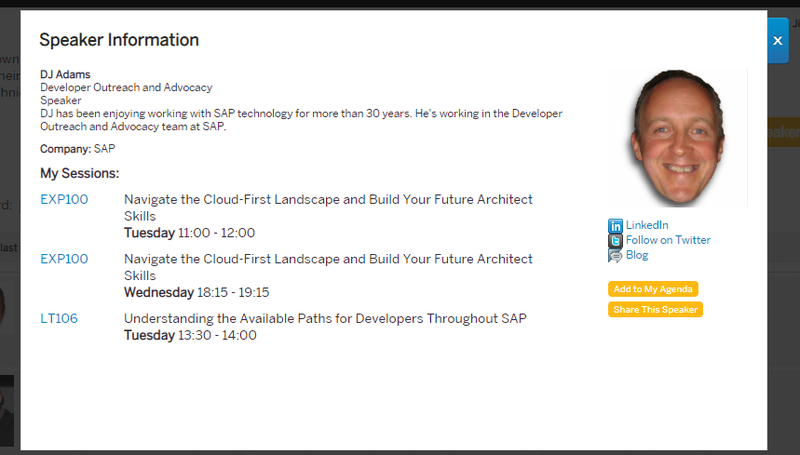 I didn’t want the SAPTechEd app (don’t ask me why, I’ve forgotten) but I did want to be alerted when a session I had added to My Agenda came due. Old school-y wins (sometimes)… I manually created calendar entries – which was good enough, although somewhat painful. I could not resist the temptation to sling some data tables and Perl code at it. I’ve appended a few comments regarding data alignment, etc.